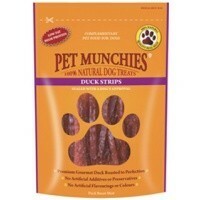 Pet Munchies Duck Strips are gourmet treats made using 100% natural, quality duck breast meat. Give these delicious treats to your pet as a chew or a reward or use them for training purposes. Naturally low in fat and roasted to perfection in their own natural juices; your dog will adore these Pet Munchies strips! Contains no artificial preservatives, additives, flavourings or colourings. Comes in resealable a bag to lock in the mouth-watering flavour.